Cirque du Furet evokes happy memories of your ferret who so loved to play and perform. 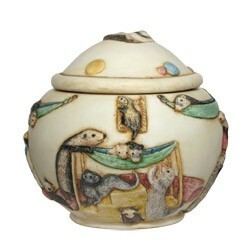 Featuring over a dozen playful ferrets, this urn is carved in the USA by Angie Caradonna and made of crushed marble and resin. Angie will donate a portion of her artist royalty to Support Our Shelter (S.O.S. ), a non-profit charity that provides monetary assistance to ferret shelters throughout the U.S. This is the last one of these urns as they are collectors items and no longer being produced.